I’ve always been a huge fan of Schloss Johannisberg, which won’t surprise any die-hard Riesling lover. After all, Schloss Johannisberg is not just one of the oldest wine estates in the world (the first documented wine harvest took place there in 817 A.D.) and is an absolutely iconic Riesling address. Then known as the Bischofsberg (bishop’s hill), the winery’s name was changed to Johannisberg (or John’s Hill) when the abbey church was consecrated to John the Baptist in 1130. The date most wine lovers are aware of is 1721, when the Prince-Abbot of Fulda restored the vineyards and planted 294,000 Riesling vines, making Schloss Johannisberg a Riesling monopole. It is thanks to his efforts that Schloss Johannisberg is viewed by many as being the first Riesling wine estate of the world. Schloss Johannisberg’s recognition as such is buttressed by a number of other “firsts”: the discovery of noble rot-affected grapes and their wines (Spätlese, or late harvest) in 1775, the production of what is most likely the first ever Riesling Auslese (1787), and the first Riesling Eiswein (1858). The estate is also famous for distinguishing among its bottlings through the use of colored seals, using Siegellack (wax seals) back in the 19th century and colored capsules nowadays. The capsule color of Beerenauslese is rosa-goldlack (pink-gold). 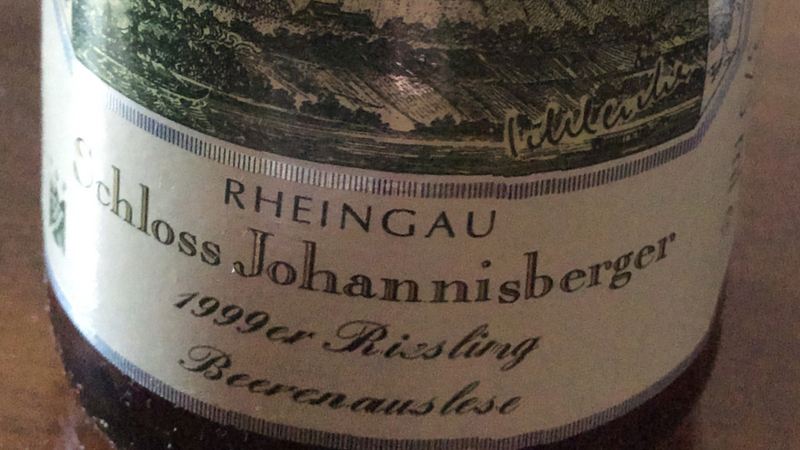 The gorgeous 1999 Schloss Johannisberg Riesling Beerenauslese (rosa-goldlack) is a very pretty wine and a far cry from some of the slightly dilute, quickly evolving Schloss Johannisberg wines of the 70s and 80s, when, most likely, a combination of overly-generous yields and young vines led to wines that were less than they should have been. No matter, under the stewardship of Wolfgang Schleicher first and Christian Witte later, wine quality at Schloss Johannisberg seems to have turned around. This beauty is still pale straw-green, with golden tinges, boasting precise and pure aromas of white peach, jasmine, and buttercups complicated by lemon drop and minerals. Almost dainty, with a magical acid-sugar balance (189 g/L residual sugar and 8.8 g/L total acidity), the 1999 literally dances on your taste buds leaving a sense of weightlessness behind that is both irresistible and unforgettable. 93/Drinking window: 2017-2026.